In a ceremony held at the Royal Festival Hall at the Southbank Centre on October 13, graduates collected their awards on stage to the applause of friends, family and fellow students. 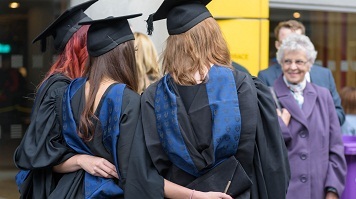 It marked the first graduation ceremony of the School of Law and Social Sciences at London South Bank University (LSBU). The School was created from the previous Faculty of Arts and Human Sciences and comprises the Divisions of Education, Law, Social Sciences and Urban, Environment and Leisure Studies. In a message to the graduating class, Professor Craig Barker, Dean of the School said: “I want to thank you for your involvement in the creation of our new School and acknowledge your achievements and your contributions to the intellectually stimulating and collegiate atmosphere. As part of the ceremony, Gillian Phillips, Director of Editorial Legal Services at Guardian News was awarded the title of Honorary Doctor of Law. An eminent and globally recognised media law specialist, Gillian Phillips has advised on some of the most culturally significant events of recent years, and attended the Leveson Inquiry for the Guardian. She has worked previously as a lawyer for the BBC and News Group Newspapers before moving to Times Newspapers Limited and ultimately the Guardian.